You are now here: How Does (Hybrid) Electronic Noise Cancellation Work? How Does (Hybrid) Electronic Noise Cancellation Work? David Clark Company Electronic Noise Cancellation (ENC) ‘X-Series’ headsets feature the latest advances in active noise reduction technology. The ENC headsets are specially designed for pilots of aircraft which generate noise at lower frequencies. Active reduction of unwanted noise is achieved by a process which amounts to cancellation of the noise by generating a signal identical in sound pressure level (SPL) but exactly reversed in phase to the offending noise ; the effect being a cancellation. A miniature microphone is placed in the ear cup next to the earphone element and as near as possible to the entrance of the ear canal. This microphone senses the noise as it enters the ear. The signal developed by the sensing microphone represents noise which has penetrated the passive attenuation barrier, and is composed of predominantly low frequencies. This signal is fed to a circuit where it is inverted in phase, amplified, and then drives an earphone creating an anti-noise signal which cancels the intruding noise. This is a type of feedback control system. An important feature of the product, exclusive to the design, is true “fail-safe” operation. By having dual earphone drivers, which are electronically independent, no interruption of communication can result from failure of the ENC system or its power source. The ENC Headset System is manufactured to the same high standards as our conventional headsets. Superior passive attenuation is combined with state of the art electronic noise cancellation in a product providing exceptional communication clarity. How Does Hybrid Electronic Noise Cancellation Work? David Clark Company Hybrid Electronic Noise Cancellation marks a significant advance in active noise reduction technology. 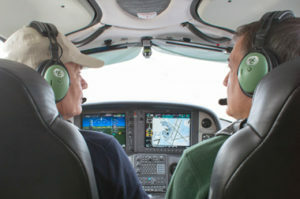 Most ANR aviation headsets feature ‘feed-back’ noise cancelling that is performed by an internal microphone placed near the speaker located within the headset ear dome. Hybrid ENC technology also utilizes ‘feed-forward’ noise cancellation, achieved by the addition of an external microphone in the ear dome that is isolated from the speaker. The exterior microphone acquires the noise before it gets to the ear canal. The external and internal (feed-forward and feed-back) signals are then inverted to produce a reverse ‘anti-noise’ signal (see chart below). The result? Unsurpassed active noise reduction and crystal clear reception from hybrid technology. Hybrid ENC technology is currently available on the DC PRO-X headset with supra-aural, rest-on-ear design and on DC ONE-X Series with circumaural, surround-the-ear-design.